Looking for Rhubarb Pie Recipes for a Rhubarb Dessert Recipe? 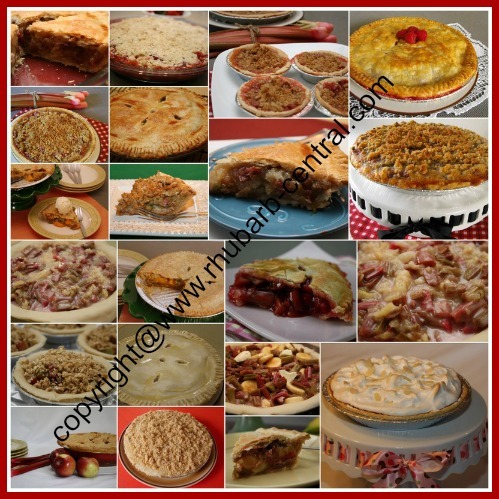 Do you want to make a homemade strawberry rhubarb pie or another fruit pie using rhubarb? Rhubarb combines well with MANY different fruits to make the most ScRuMpTiOus pies! Did you know that rhubarb is also know as "pie-plant"? No wonder then, that the word "rhubarb" and "pie" are synonymous! Pie Recipes range from the quick and easy to prepare ones to the recipes that are more intense and that take considerably more time and effort (and patience!) to create. Rhubarb Can Be Combined with Almost ANY Fruit to Make the Best Pies Ever! ❥ It's the only pie dough recipe with lard that I use! The blended flavour of tangy rhubarb and sweet strawberries combine for a fabulous, lip-smacking treat. Add pastry or crumble pie crust, and your taste buds explode! Both rhubarb and strawberries ripen at approximately the same time of the summer, therefore a fresh fruit pie using rhubarb and strawberries a good choice for dessert. Fresh or frozen rhubarb and fresh or frozen strawberries can be used for most of the pie recipes listed above. For the simpler and easier to prepare recipes you can buy a ready-made crust (dough /pastry pie crust or graham cracker crust) and add your own filling, of fruit, pudding, cream or any other filling or combination of fillings you wish to include. The more experienced bakers, or those with a little more time at hand, may want to make their own pie crust. When I do not have the time to make my own pie crust, I purchase a package of two pie crusts (dough /pastry type). I proceed to use one of the crusts for the bottom of the pie, and the other one for the top. I find this works quite well, and of course, it saves a lot of time! But ... we all know that home-baked pastry crusts make your pie creation look and taste even better! Although you can purchase ready-made graham crumb crusts, I find that homemade crumb crusts for pies are simple to make, much tastier, and have a thicker base. The base of the ready-made purchased crumb crusts often break apart when you attempt to serve the pie slices, because the filling is too heavy for the crumb base. I have included many different types of delectable recipes that are deeply rooted in great-tasting nutrition! Yummy! ... Who can resist a Homemade Rhubarb Pie?